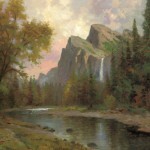 Thomas Kinkade has touched many people with his artwork. Over the years Thomas Kinkade Collectors have sent us their stories of real life inspiration, and we are proud to share them with you. 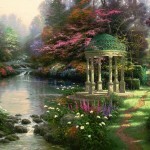 To share your Thomas Kinkade story or memory, click here. 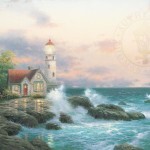 My very first Thomas Kinkade collectible was given to me at a very dark, and scary time in my life. I had all but given up hope I would ever be able to stand on my own again. Your paintings bring back a tender memory I had with my dad on Mother’s Day, 1987. My father had leukemia and was dying. 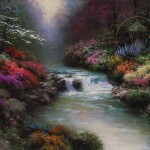 You may never be able to fully understand or comprehend on this earth how much your paintings affect people. 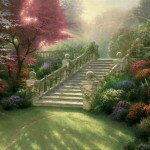 I found “my” painting, Stairway to Paradise, at the lowest point of my life. No matter how dark our life at times may seem, the Lord always lets the light of hope and serenity shine through. It was during this dark time that I first discovered your work–and it helped me immeasurably. Sunrise Glass Gifts from Trend Setters Ltd.